For the past three weeks or so, I have been just climbing and not doing anything else for the first time in a looooong time. I’ve been soaking up the rest time and starting to get back to feeling normal after the whirlwind of the last few months. I’m in Siurana (Spain) right now, climbing limestone. It always takes some time for mind and body (mostly the skin on my middle two fingers!) to adjust to this alien rock type again. On the first couple of days I just took in some classics like Kalea Borroka 8b+, Migranya 8b and a flash of La Cara no Miente 8a+. Since then I have been heading over to Margalef and soon found myself staring the belay of an 8c+ in the face on redpoint. But I hesitated, feeling I was out of gas and came off. 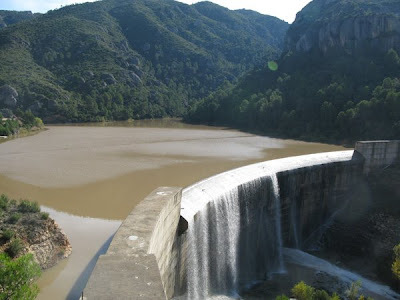 That was a shame since heavy rain the next day flooded the river and made the crag inaccessible for several more days. Always after climbing big projects like Echo Wall, I have to take quite some time to figure out if I still want to be climbing at all. That’s not to say I’ve ever felt that I don’t want to, but after such a big experience I think it’s normal to have some months of figuring out where you stand and what you want to do next. After I did Rhapsody in 2006 I got pretty psyched to do a lot of training and increase my level a bit. I already had Echo Wall in the back of my head, but the main reason was just because I enjoy training. I am feeling that again right now, especially as the last month’s training seems to have had a good effect on my level. 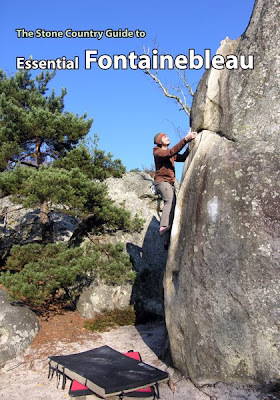 I have hard projects on my list in bouldering, and winter climbing already, but not really any in trad or sport climbing. In these disciplines I’ll need to travel a bit, and see what comes my way. That will be fun! 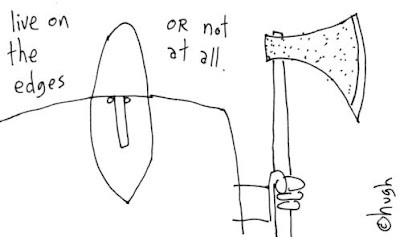 As soon as I’m back, the ice tools will be out and I’ll be in the cave getting strong on axes for the big yin. It’s been good so far to spend time consolidating 8c and 8c+ and doing some more routes quickly, for a while. I needed to do this just to see what it was like again. I don’t get a chance to do that in Scotland at all because I’ve done all the hard routes and the projects are all sick hard. But perhaps out of habit or more probably personality, I have confirmed for myself once again that I am happiest in long term project mode, on proper hard routes. 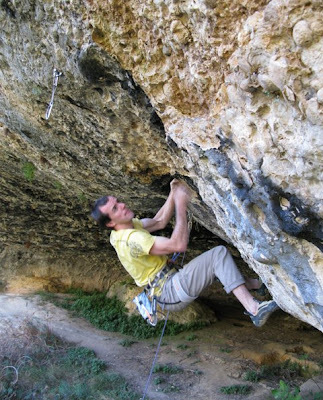 So I had gone back to trying things in the 9th level for the rest of my time, but when Dave Redpath left without finishing an unbelievable roof at Margalef that he had bolted earlier in the trip, it was time to back onto seek and destroy mode. Dave reckoned it would go for me but sounded hard above the lip of the cave. After a couple of hurried work sessions I set off and swung through the roof to arrive at an uncomfortable bat hang in a great position on the lip. The hang was a toe-torque rather than passive jam, so after a minute I found that my feet were too tired to let me pull back up to the holds. Doh! What the hell am I going to do now? After a few sets of crunches and pathetic swings at the pockets, I resorted to clambering up my own legs to regain upper body contact and get on with the crux. Happily the unintended extra stay in upsidedown land, and extra arm swinging helped shift the pump in my arms and a grunt around the lip got me quickly to the belay and my first Spanish first ascent – Knuckleduster 8b. 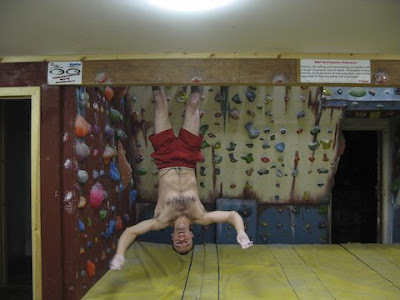 Imitating the bats that live in the roof crack of Knuckleduster 8b, during the first ascent. The hotly anticipated new DVD from the Hot Aches guys will be with us soon - pre-orders are being taken in the shop now. It showcases five of Britain's best climbers on a spectacular array of hard routes; the terrifying Walk of Life (E12), one of Scotland's toughest winter routes, gritstone's best 'last great problem', the youngest female ascent of an E7 and the world's maddest mantel; it's all there. Dave is still in Spain just now, happily clipping bolts in the sunshine but he'll back in time for Kendal at the weekend. The premiere of Echo Wall passed in a blur for Claire and I on Sunday, with our first ever film picking up two awards, for Best Climbing Film and Best Film at the Edinburgh Mountain Film Festival. It was very overwhelming to sit with 500 of you and watch the film we've worked night and day on flat out since the end of July. Our feet still haven't touched the ground as I left Glasgow early the next morning for lectures in England and Claire has been busy sending out all our pre-orders of the DVD from Fort William. Thanks to everyone who ordered their copy in advance - I hope you enjoy the film! If you would like to order a copy, you can get one here. Maybe I'll catch some of you in Preston on Friday night, Cotswolds at 7. I have been a busy man. I’ve had a list of articles I wanted to write for this site for absolutely ages, but the great black hole of Echo Wall (the climb, then the film) blocked out everything else for so long. But I’ve been furiously preparing the articles all this week and uploaded them. They cover quite a range of subjects. Updated supporting article on cold treatment for finger injuries answering all your questions on it after my videocast. 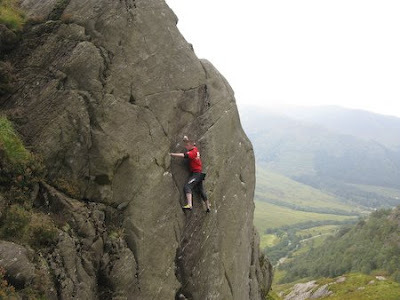 A list of the perma-dry crags in Scotland so you can keep climbing on those rare days when the sun doesn’t shine here. Some suggestions for crag itineraries for those of you how haven’t visited Scotland before and want to know the best spot to take in. 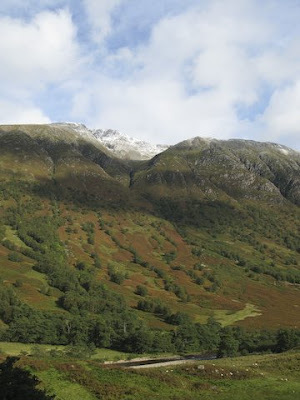 A text, image and video topo of the newly developed (and rather good) Skeleton boulders in Glen Nevis, with seven youtubes to whet the appetite. I’ve also just built the website for our production company Rare Breed Productions, that we started for making films and other creative things. It has the full credits for Echo Wall including all the places to get hold of some of the tracks from the soundtrack, which I’ve already been getting asked about a lot. Finally, I’ve just added the new Onsight DVD just out today to the shop. Many of you were emailing to ask if I’d be selling it because you were keen to get it along with my e-book How to Climb Hard Trad which I’m still giving away with all DVD and book orders. Phew! Between Echo Wall, this lot and a pile of other stuff, I’ve been spending some quite silly hours in front of the screen since July. But tomorrow is my last day in front of a computer screen for 6 weeks! Yeehaa!!!!!!!!!!!!!!!!!!!!!!!!!!!!!!! Maybe I’ll catch some of you at EMFF or my lectures in Harrogate, Manchester and Preston next week. And I should have some copies of the Echo Wall DVD too. Exciting stuff, but it’s fair to say I’ll be a tad jumpy until the delivery man comes with the DVDs. Training is going reasonably well right now although I’ve had to skip a day again because of work. Now I’m feeling better and stronger in my sessions when I’m climbing every day than if I take more rest days. Five years ago doing these kinds of sessions every day would have floored me. Another small advance in PB on the campus board tonight. 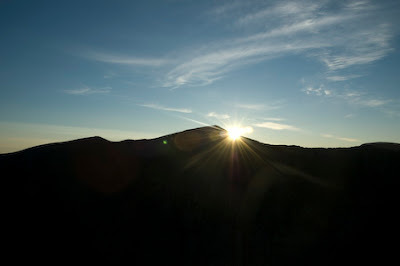 The body is responding in the right direction, and a climbing trip is looming in the future. It’s great to be excited about completely new projects again. 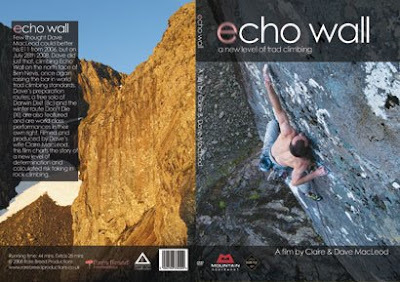 We’ve also been getting asked about wholesale of the Echo Wall DVD for those of you that run your own shops. For wholesale copies, just get in touch and we’ll give you the lowdown. Sometimes you need to make sacrifices, to meet your goals in life. This means some hard choices. But you know deep down when it’s the right thing to do. As part of our film about Echo Wall we really hoped to get an interview with the ice climbing legend Jimmy Marshall, who was perhaps the finest ice climber ever in the step cutting generation which ended during the late 1960's when people started using two ice axes and frontpoint crampons to climb ice. Jimmy is famously reluctant to give interviews so we were extremely lucky that he agreed to give us an hour of his time to share stories and thoughts on climbing on Ben Nevis. Some of these are in our Echo Wall film as well as an extended edit of the interview in the DVD extras. Here is a short teaser from that, where Jimmy describes a massive factor 2 fall while attempting a new winter route on the Ben in the 60's. Brilliant! 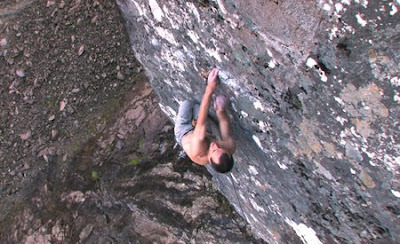 Neil Pearsons, editor of Climb Magazine has posted up the first review of the Echo Wall film on his site here. Glacier polish? 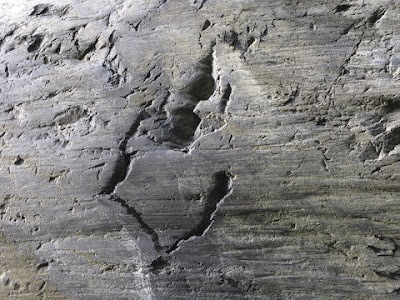 or a primeval footprint? You choose. 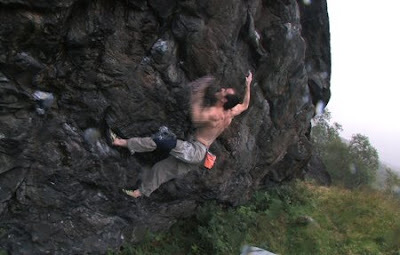 Lovely rock on a V14 project, Glen Nevis, henceforth dubbed the 'Bigfoot project'. It’s been an interesting experiment, climbing the hardest route of my life but not giving it a grade. Contrary to what some people seem to be thinking, this was not to make any particular point, merely because I didn’t know what to grade it. That said, it always irritated me that the grades of my routes or repeats ended up at the centre of the discussion, rather that at the fringe where they belong. I have noticed people even referring to my climb Rhapsody as ‘E11’ as if that were it’s name rather than an insignificant and rather meaningless number attached to it. Part of the reason writing this blog is useful is that I can answer question folk commonly ask and hopefully steer the chat back towards what’s important - the climbing - and away from grading (ha! he says, optimistically). Anyway, perhaps some more details will help folk get on with pigeon holing a beautiful climb into a ill fitting picture. Right now, I still have no idea what to grade Echo Wall, so I’m not going to at the moment. Perhaps at some point I’ll have repeated some more routes given E grades in double figures and have a better idea. Grades evolve. With few references to go on, they are pretty shaky. Once there are more routes and more climber’s opinions on them, they become a bit more useful. Echo Wall is much harder than any trad route I’ve ever done or tried, thats all I know right now. Quite apart from the line and the mountain, I was really inspired by making a route that had the combination of 8c or harder climbing, an uncompromising level of seriousness (which, if you need it spelled out, means you would die if you fell off it), and a remoteness of situation that would create a logistical challenge of actually working on the climb. Echo Wall was perfect in this respect. 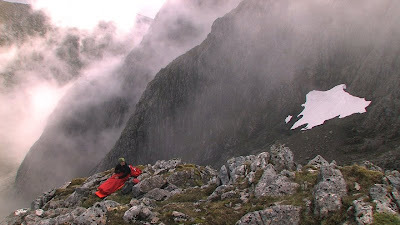 None of the Ben’s hardest routes to date have had high standard physical climbing. Why? Because it’s just not practical. It’s covered in snow, rain, mist, lichen or moss 99.9% of the time. Go to somewhere like the lakes and you’ll get nice weather, nice chilled approaches and pretty small and convenient crags. When I first began to think about trying Echo Wall, I figured I would be able to absorb this hurdle and that the climbing would be the main problem. The climbing challenge was be to be able to climb 9a at the same time as spending lots of time in the mountains to have a realistic chance of linking Echo Wall on a top rope. As it turned out, this was the easy bit! My headache here is how should this be reflected in the grade? We have trad routes given big grades like E9 or E10 that are completely piss on a toprope (like 8a+ or easier) but their grades stand the test of repeats because of either seriousness or mountain situation (often stretched quite a bit!). I actually agree that proper mountain trad routes should have some recognition of their remoteness and awkwardness reflected in the grade. Echo Wall feels like 8c/+ on a top rope, with the real prospect of death from the redpoint crux, on a crag with more logisitcal issues than any other mountain crag in the UK. Do you see my problem? I am uncomfortable with the feeling of grades advancing too quickly due to overgrading, but on the other hand feel that Echo Wall might well earn a laughable quanta of E points over anything else I’ve done, based on the way the E scale has been used traditionally over the past couple of decades. I just don’t know. Grades will always be very shaky and mobile at the cutting edge, but it would be a shame for these grades to lose any credibility they did have just because the standard going through a period of rise. On the other hand, if you really believe a route is a certain grade, it’s important to just be straight up and make the proposal. James Pearson has just done this with a stunning looking new line in Devon. An inspired piece of work from one of the world’s top climbers in the trad and bouldering disciplines right now. And top effort for sticking his neck out and pinning the E12 grade to a climb for the first time. So what is the solution to all this uncertainty? Like most hard truths, you knew it already - time and repeat ascents. 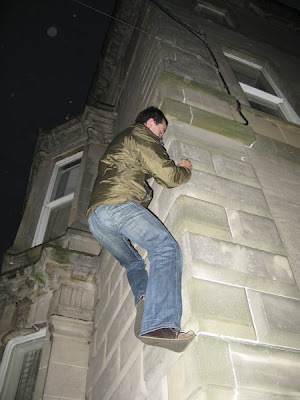 It will take climbers to drag themselves to these corners of our isles and make the time to get these things repeated. Until then, comparison between them is a fools errand. For that reason, Echo Wall is ungraded, for now. It doesn’t matter, because the interesting part is the story of the ascent, and I’ve not been nearly so cautious in making sure it can be heard! Echo Wall took me longer to link on a top rope than A’ Muerte 9a, i.e. Many days, while in Spain I was able to consistently climb 8b+ and 8c in a day. Echo Wall is 8a+ up to the roof at 12m, with the smallest BD micro cam for gear. This section is comparable with If Six Was Nine E9 in the Lakes. At the roof I could get about 40 seconds rest out of the kneebar. After the roof is the technical crux. There are three bits of gear protecting this - a poor Camalot in a very shallow slot, a good wire but in a suspect tooth of rock and wire in dubious rock. It’s dubious because there used to be another wire placement right beside it which was the best of the lot, but the placement broke and fell off randomly in between my visits. Scary! Right after the crux there is an RP3, quite good but blindly placed. Then a runout to a shakeout. The shakeout isn’t so good, and afterwards there is final hard section and this is where I fell many times when trying to link it. There is an RP and very poor skyhook at the shakeout, but the placement is in a loose flake of rock so I’m pretty sure they would just pull right through if you fell here. You have to do the final boulder problem pumped, knowing if you fall you will die. 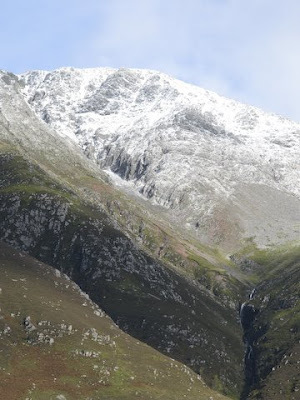 If you are into winter climbing, the sight of the first autumn snows on the mountains has strange effect on you. 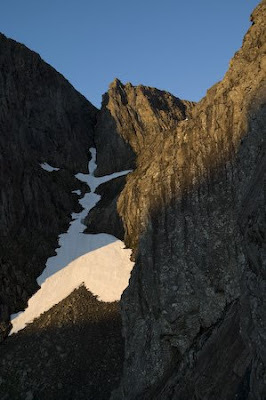 Partners, rock climbers, and other groups of sane people find it quite unfathomable why the sight of a few bits of white gets us so excited, but it just does. It’s a feeling that reminds you of when you first started climbing – everything is a possibility, who knows what the coming season will bring. But either way you know you are going to enjoy it. It was bitter in the glen right through the day and frosty again tonight. Here is a trailer for the Echo Wall film. We are expecting the DVD in late October (I hesitate to say an exact date!!) but if you would like to get your copy in, you can pre-order it from the shop now. Although my time recently has been so hectic with our work on the Echo Wall film, things have been more relaxed in my climbing, which makes a nice change really. Relaxed in some senses, but not in others you understand. I have been ruthlessly attacking Kimber’s campus board every night and mixing this with loads of bouldering and endurance training ready for the winter season of valley level rock climbing. I’ve not had enough time for any flexibility work which has been irritating me, but I will have soon. Since doing Echo Wall I’ve gradually come to enjoy the feeling of not having any particular looming focus of a big project right now. It’s something I obviously had a lot in past years, but have been really focused on big hard redpointing routes over the past couple of years. This winter I’ll be bouldering a lot and onsighting much more too, mainly on mixed. People sometime ask me why I don’t do more onsighting, but I think they forget that I do all year long, just that it’s on winter mixed. I have three big winter lines at the top of my hitlist. One is just so laughable it’s ridiculous, but in a funny sort of way, I could see myself doing it. So the ice axes will be featuring in my training during December too. 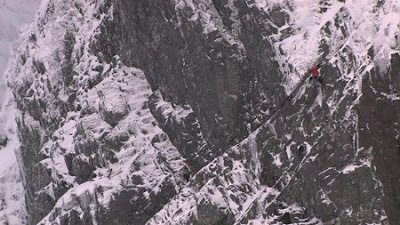 My goal here is to do something of the order of Echo Wall, but in the discipline of winter climbing. I have the projects, I have the psyche and some availability of partners (the Shields is particularly psyched this season). So all that’s left is to get amongst it. 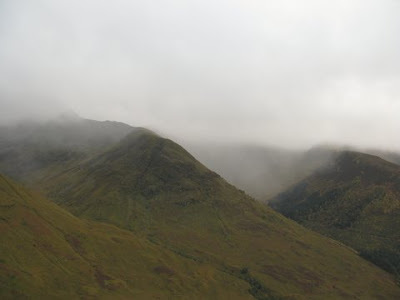 Looks like some early dustings of winteriness are hitting the highlands over the next few days too. There is nothing like that anticipation if you are into winter climbing! 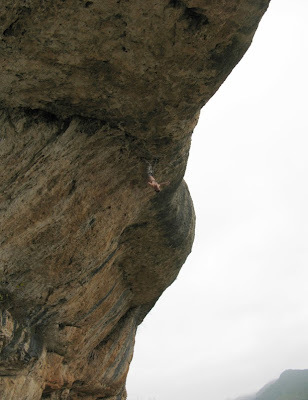 Kev Shields soloing Sweet Little Mystery E4 6a, Glen Nevis last week (the film of this is in the Echo Wall extras). It’s been another week of ups and downs working on our film of Echo Wall. We were most definitely in need of a break from the screen by Friday. It was Claire’s birthday so we headed for Tilda Swinton’s very retro cool film festival in Nairn. Just being outside the house was so brilliant. I got really excited to be out travelling around Scotland after so long indoors. On our return I managed two brief escapes to Sky Pilot to claw back the fitness, throwing myself on the problems like no tomorrow. The film inches closer to a final cut. Most exciting! We’ve certainly chosen the right moment to be editing a film. The Lochaber monsoon has been impressive as usual, but excelling even itself for August. As always, I’ve been learning lots from the whole experience of doing Echo Wall, even though the route itself is done. 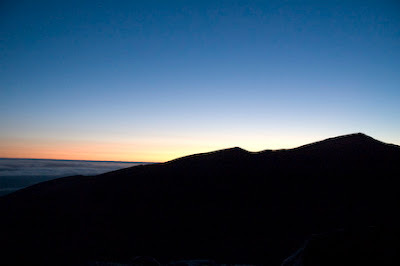 I was expecting to feel, and did indeed feel a massive sense of nothingness after doing the route. After so long aligning yourself to one goal, it’s suddenly gone and you are left with no focus until something replaces it. That’s nice because it reminded me just how much I like the simple act of climbing, solving climbing problems being outside. A massive reminder has been of my need (or addiction) to exercise. I’m not sure if it’s exercise or rock movement or whether they can be separated at all. But either way, it’s real! I’ve been in total withdrawal these last two weeks, literally climbing the walls in the house. This is a happy addiction. If it dies before I do, I’ll be extremely surprised. I’ve been reading a lot too about approaches to risk, and satisfaction from things like sport. Partly for my own sake and partly to help me distill my ideas to communicate in our film. Three general traits of human nature, demonstrated in research, but obvious and tangible to ourselves only in moments of clarity, usually after a highly emotive experience, stand out for me. The first is our aversion to loss. People hate to lose things more than they take pleasure in gains of a higher magnitude. A gift of an amount of money affects our mood far less than the stress caused by losing an equivalent amount. This aversion to loss progresses to a default position of unreasonable aversion to risk when coupled with a second trait. We aren’t very good at visualising probabilities and usually end up stressing far too much about remote possibilities while distracted from the really important stuff. We worry more about small chances of injury, public failure etc than we do about the rewards and satisfaction of going for something good. The third is our rather poor ability to forecast our own feelings down the line. In general, we place way too much importance on immediate gratification, at the expense of suffering short term discomfort for a much larger windfall of satisfaction later. This has the secondary problem of us not giving enough weight to things that will make us happier for longer, but forecasting in error that sources of immediate happiness will last much longer than they actually do. Avoiding these natural pitfalls is a tough job, requiring constant attention. But awareness of their constant pervasive influence at least allows the opportunity to stay above them. Over the past two weeks I have done a good job of replacing climbaholism with workaholism. It’s funny how things fit together nicely. 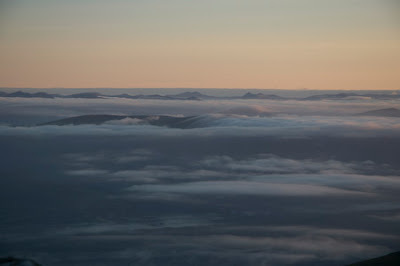 August just happens to be the worst month for climbing in Scotland (often too wet in the mountains and getting colder, but still warm and midgy in the glens) and this August as been something of a monsoon. It was a good decision to grab my chance on Echo Wall when I did. If I hadn’t it would have been next year for sure. Is this workaholism healthy? Definitely not. A week straight of 4/5am finishes makes one’s edges a little frayed. But it has it’s uses. and in the very short term can be a good idea. After setting up our production company to make the film about Echo Wall and working with Claire on some editing, I headed back up the Ben as soon as the clouds broke to film a bit of running and nice footage of the mountain. 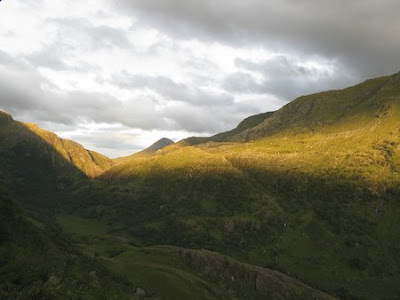 Bill Murray said “ No man will ever know Ben Nevis” When I was climbing Echo Wall I did feel like I did have a small window, a partial insight into understanding how to move well on this mountain, just for a second. But the feeling, illusionary or not, soon wore off. Arms and legs are hurting once again from the climbing and running efforts - a good feeling. Time in the computer chair can be deadening for both mind and body at times, but so long as the connection to climbing isn’t allowed to become too distant, it can strengthen the motivation. I always forget just how much I love rock movement until I have enforced time away. This is great for me. After 15 years of rock climbing, to still feel the psyche to be on the rock stronger than ever makes me so excited and full of energy to start new projects, whatever they might be??? Right now I’m in the car with Claire on our way to meet with Jimmy Marshall and talk about Ben Nevis climbing. You’ll see it in the film. After a week of loooong days in front of the screen or filming things for Echo Wall, it's hard to express how much I want to boulder at the present minute. I was knackered after finishing work at 10pm and contemplating the choice - train, or go to bed. I'm really glad I trained. Good feeling to be hanging from one hand on the hangboard again. Note to self: if in doubt, train, you'll be glad you did. More blogging tomorrow. Now, sleep. Many many thanks for all the comments you guys sent Claire and I over the past week about Echo Wall, and thanks for coming with me on the path, through my blog. It’s been a strange week since doing the route, with many thoughts running through our heads and interesting discussions. The only time I’ve ever done this type of thing before (really dedicate myself to one thing for a spell) was with Rhapsody in 2006. So I was expecting to feel a highly strange sense of ‘nothingness’ after completing it, where this enormous part of your life suddenly evaporates. Whilst I am deeply happy with climbing the route and about every part of the process, it’s kind of sad in a way when it’s over. It might sound funny or even objectionable to some people but I’m most in my element in the thick of grappling with these projects. Right now I feel kind of like a crashed car lying in the middle of the road on it’s roof with the engine still roaring and wheels spinning. It’s hard to wind down, suddenly at least. No worries, because life always serves up so many brilliant things to fill the day while you wonder what to do next. Some days off are planned with Claire. But the main immediate activity that has replaced climbing Echo Wall has been filming Echo Wall!! The implications of this are somewhat scary. And scarier still after we worked out some ‘to do’ lists. But we are going to have a go at getting it ready for October. We reckon that the Ben is such a special place and it really deserves someone to go for it and try to capture it’s character, inspiration, intimidation and of course it’s beauty on film. I’ll talk more about how this is coming along soon, but for now here are some photos from my filming the other day. 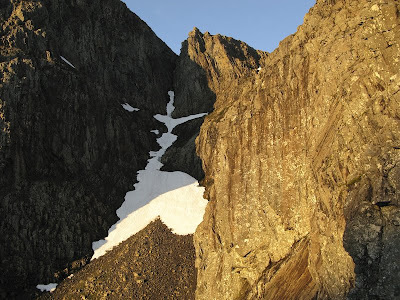 Echo Wall, being on a big north face, doesn’t see much sun, But Echo Wall catches an hour or so just after dawn in mid summer. So my first stint behind the camera was to sleep out on Tower Ridge and capture a time lapse of the sun hitting Echo Wall. Tell me that doesn’t make you want to climb? !